This entry was posted in Home and 'Hood and tagged 7/11, apartment building, beer, closed, fish balls, fleabag, Magnum bars, ode, yogurt by Ruth. Bookmark the permalink. Across Sukhumvit, yeah. A longer walk and an inferior selection. Noooooooo! I feel your pain. Pure gold that post, pure gold. Did you know when you open their website (so I could get an email address) it plays a ding dong sound just like when you walk into their shops. No “Sawadee Khaaaaaa, Chern Kaaaaa” though which was a little disappointing. Anyway, loved the post and have retweeted it as well. Hahaha! I can’t believe their website makes the same sound as their stores! Mind is blown! Oh noo! How could that ever happen? I used to live 2,5 years 7 steps from 7/11. 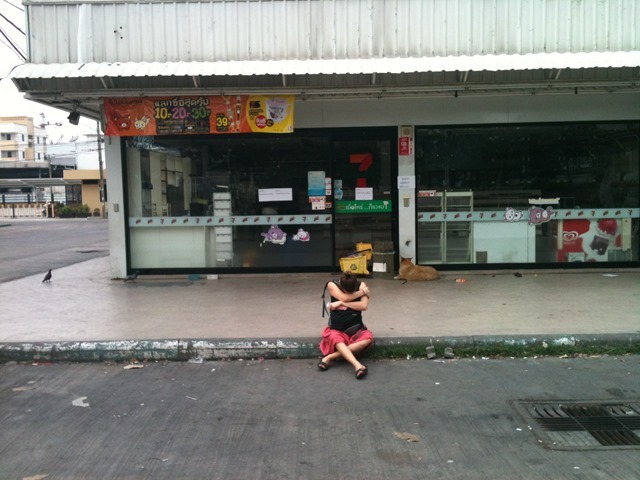 Now Im 1 and half minute walking distance from the nearest 7/11 and I feel like my life is basically over :D.